So Progressing on and actually starting the build of this hunk of technology I decided to tackle the servo first, as I had all the equipment all ready. 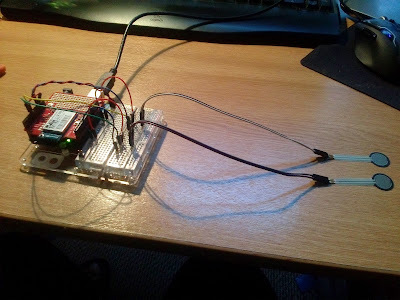 So simple enough I hooked up the servo to the Arduino and managed to get it working fine with a couple of test values. Using some of the stuff I learned from Chris' and the IBM workshops I wrote a little sketch that connects to the web through my WiFi and subscribes to a topic on Chris' remote MQTT broker. It takes the values coming in from the topic and if they're integers and between the values of 0 and 170 it sends them to the server. I'm using a max value of 170 because my little ol' servo's a bit busted and struggles with values above 170. Using mqtt.io I sent some test values over and it after a little fiddling it worked. The next step was to hook up the servo to a set of speakers. 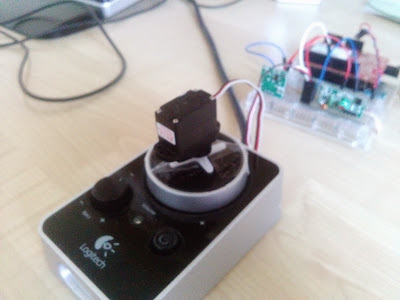 I attached a spoked attachment onto the servo, and then taped the attachment onto the volume control for my parents' PC. The results were definitely mixed. There were many who didn't really seem to be with it, but mostly because they were evidently rushing around Roland Levinsky trying to get deadlines done. However we got quite a few good responses who really seemed to enjoy the idea. Overall I felt the presentation went really well. I think we conveyed the idea fairly effectively and the demo went off without a hitch. One thing we probably should have elaborated on a bit more was the reward system. So after much deliberation and focus on getting our mission, vision and some of other core ideals of Bento set in stone on content we began the work our presentation. It took a lot of thought to decide on the content of the presentation. To begin with we took our mission, vision and some core ideas. A lot of it had to be cut out to properly format it in the form of a presentation. 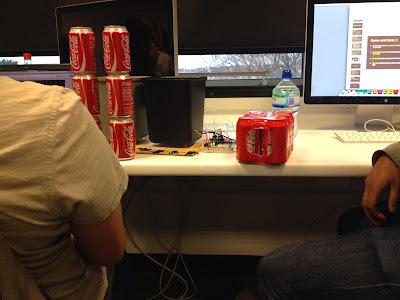 To to begin development on this project we needed to sort out how we'd measure the content on the bins. One of the ideas was to use the ultrasound distance sensors on the lids to see how high the bins had piled up. However Mike mentioned to us that another group were already using this. Feeling the way to go was weight we asked Mike if DAT had any weight sensors. Alas not. Mike did say DAT had some force sensors though. These were similar to the ones we'd used for Coffee. The tutorial portion of the workshop was pretty cool. Chris Hunt and the IBM lads were showing us how to use Node Red, an IBM developed open-source webapp that lets you take inputs, manipulate them and connect them to outputs. Really simple concept, and pretty well implemented. I learned quickly how this Node Red thing worked, and it was pretty cool as it was based on Node JS, which is something I'm keen on learning anyway. 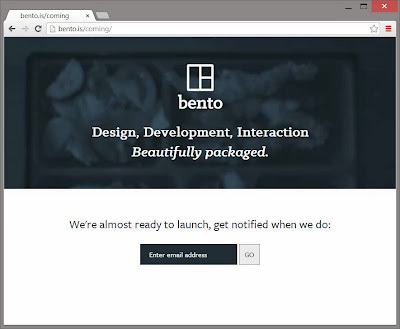 We came up with the concept of the bento.is to allow is to engage creatively with the URL. For example our holding page is bento.is/coming. 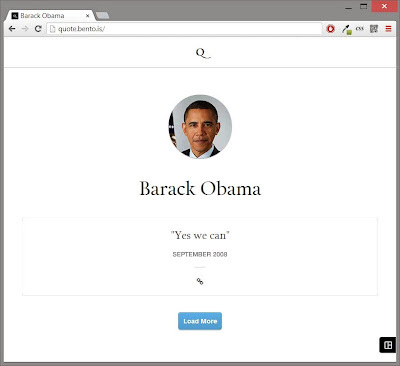 In future when we launch we could have bento.is/here. bento.is/us could be the team page, bento.is/this could be an about page and so on. Feeling that the concept of a bento box related to our ideals we decided to call ourselves Bento. Providing technology, a service and our skills - all of which come together in a nice, beautifully packaged product. Once again following a similar process we developed our USP. Our biggest USP is the fact that we really enjoy what we do - we find our line of work extremely fun and challenging. Chris' USP was clearly the strongest of the three and embodied our ideals very well. Because of this we decided that his one was clearly the one we should use. Cai: To be the number one advanced technology agency in the south west of England. Providing clients with products that appropriately meet the desired brief 48 hours before the specified deadline. Retain 80% of customers in future services, through implementing thorough design techniques and combining this with the highest quality standards of work that adapts to the benchmarks of the industry.